Powerplay departs from Abell Point Marina on Mondays, Thursdays and Saturdays at 12:00pm and returns on Wednesdays, Saturdays and Mondays at 11:00am. With all the mod-cons of the more upmarket catamarans such as air conditioning and a large fly bridge (complete with a tanning deck) on the second level, it’s a budget friendly choice for Generation Y travellers who aren’t eager to slum it or enough of a social butterfly for the party boats. Aft blue lights – great at attracting and spotting marine life at night! 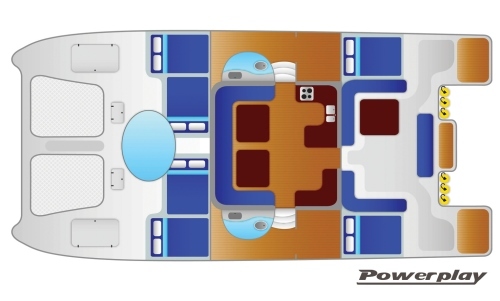 Powerplay is a rendezvous dive boat, which means that although there is no diving equipment on board the yacht – it does offer the chance for guests to try it as it does meet up with another vessel for guests who would like to give it a go. All scuba dives must be pre-booked prior to departure. All dives are subject to physical fitness and health, and certified scuba divers must bring their PADI or AUSI card with them. All tanks, weights and gear are included in the rate. Guests are permitted to do one dive per trip at $65.00 per person per dive. Please note that there is also fresh fruit available to eat on board at all times! Please also note that this is a sample of menu and is subject to change and/or amendments. If you have any special dietary requirements we can certainly accommodate this, but please let us know at the time of booking. If you do not fit these requirements, you may not be able to book this tour. Does an adventure on Powerplay tickle your fancy? Check availability or the best rate for any specials contact us on 1800 550 751. Please bring only a small soft bag with: change of clothes, hat, swim-wear, beach towel, sunscreen 30+, waterproof zip bag for electronics, warm pullover for the evenings (seasonal), and one pair of shoes for bushwalking. You will also need to bring your own alcoholic beverages, available for purchase in town. No glass bottles please. Please note no large bags, bags with wheels or sleeping bags will be allowed on board. All cancellations will incur a 25% cancellation fee. Cancellations made within 30 days of travel will result in a 100% cancellation fee. If the sailing company has to cancel the trip (prior to the boat's departure) and we cannot offer a suitable alternative, then a refund will be given minus card fees. We strongly recommend that you have travel insurance, especially during the wet season.